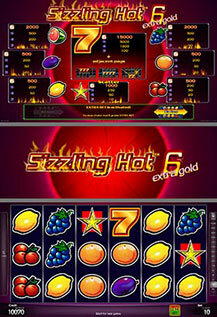 Look for the added Extra in Sizzling Hot™: extra hot, extra 6, extra gold! The EXTRA BET makes this version of the famous video slot classic a sure bet for extra hot fruit game fun on 5 lines and 6 reels! If you play with 5 reels, all wins are for combinations of the same kind and from left to right, except Scatter. Choose EXTRA BET to activate reel 6 for improved wins! With activated EXTRA BET, all prizes are for combinations from left to right AND right to left, except Scatter. 7 pays adjacent, with activated EXTRA BET!